CAMP LIFE, the new digital series produced by Top Rank®, will make its debut later this week with a four-part feature on undefeated two-division world champion and top pound for pound fighter TERENCE “Bud” CRAWFORD. Designed to give a behind-the-scenes look at training camps of fighters in the Top Rank stable, CAMP LIFE gives fans a real taste of training camp as fighters prepare for their battles. CAMP LIFE will be distributed on various platforms, including Facebook, Top Rank’s You Tube channel, Twitter and Top Rank’s website.. In CAMP LIFE: TERENCE CRAWFORD, viewers take a journey to Colorado Springs, where Crawford, surrounded by family, trainers and sparring partners, prepares for his May 20 defense of his unified World Boxing Organization (WBO) / World Boxing Council (WBC) / Ring magazine titles against former Olympic gold medalist and top-rated contender FÉLIX DÍAZ in a marquee all-action fight.. The fight will take place at Madison Square Garden’s main arena and will be televised live on HBO World Championship Boxing®, beginning at 10:15 p.m. ET/PT. 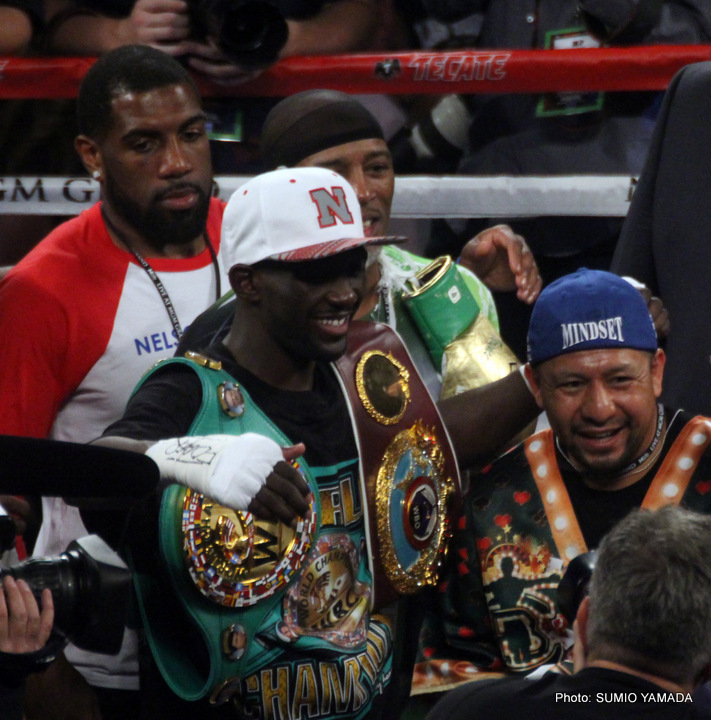 Here’s a preview of the Top Rank-produced four-part series CAMP LIFE: TERENCE CRAWFORD. Shakur Stevenson Ring Return will be on Crawford – Díaz Card at The Garden! Hot off his high-profile pro debut, 2016 Olympic silver medalist SHAKUR STEVENSON will soon return to the ring for his second professional bout. The crown jewel of the U.S. Olympic boxing team and the Pride of Newark, New Jersey, will be featured in a six-round featherweight bout on the undercard of the TERENCE “Bud” CRAWFORD – FÉLIX DÍAZ World Junior Welterweight Championship, Saturday, May 20, at the Mecca of Boxing, Madison Square Garden. He’ll be facing Carlos Suarez (6-3-2, one KO), from La Plata, Argentina. This will be the first time Stevenson has fought close to home since the New Jersey Golden Gloves in early 2015. Crawford vs. Díaz will be televised live on HBO World Championship Boxing®, beginning at 10:15 p.m. ET/PT. Stevenson, 19, made his pro debut, on April 22, defeating Edgar Brito via a six-round featherweight technical decision. The fight was stopped just after the beginning of the sixth round with the ringside doctor ruling that Brito was cut too badly from an earlier clash of heads to continue. Stevenson won every round on every judge’s scorecard. The fight was featured on a world championship tripleheader pay-per-view telecast at StubHub Center in Carson Calif. Stevenson has been training for this fight in Colorado Springs with Crawford. In last year’s Summer Games, Stevenson sailed though every stage of his Olympic competition in Rio De Janeiro before losing a close split decision in the bantamweight championship fight to 2012 flyweight Olympic gold medalist Robeisy Ramirez of Cuba. Ramirez swept the judges’ scorecards in round one with Stevenson returning the favor in round two. In the third and final round, the closest of the three rounds, two of the three judges gave the round to Ramirez and the gold medal, by the slimmest of margins. It was the best finish for an American male boxer since Andre Ward captured the gold medal in the Athens Games of 2004. Newark came to a standstill each time Stevenson stepped into the ring in his quest to win Olympic gold. On the day he fought Ramirez, “Stevenson Fever” was at its peak. Barry Carter, columnist for the Star-Ledger, reported the following: “At Broad and Market streets, the city put its ’24 Hour of Peace’ rally on hold and set up a big screen for residents to watch the fight.” At the CityPlex 12 Theater in Newark, hundreds of fans and family members wearing t-shirts emblazoned with “In Shakur’s Corner,” crammed in to see the fight, all sitting on the edge of their seats, to watch the live-streamed fight and cheer for their man. Ward is now part of Stevenson’s management team along with James Prince and attorney Josh Dubin. The only boxer to make Forbes “30 Under 30” in its Sports category, Stevenson was selected by a panel of judges comprised of James Harden, shooting guard for the Houston Rockets, Phil Knight, Chairman Emeritus of Nike and Casey Wasserman, Chairman and CEO of the Wasserman Group. The oldest of nine children, Stevenson, who is named for the late rap star Tupac Shakur, was introduced to boxing by his grandfather, Willie “Wali” Moses, at age 5. Now based in northern Virginia, Stevenson is trained by Moses and Kay Koroma. Promoted by Top Rank®, in association with DiBella Entertainment, Tecate, Antonio Leonard Productions and Madison Square Garden, remaining tickets to the Crawford vs. Díaz world championship event are priced at $250, $150, $100, $75, $50 and $35. They can be purchased at the Madison Square Garden Box Office, all Ticketmaster outlets, Ticketmaster charge by phone (866-858-0008), and online at www.ticketmaster.com and www.thegarden.com.